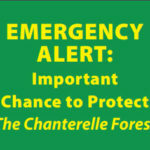 The beautiful ‘Chanterelle Forest’ is faced with logging by the Sunshine Coast Community Forest (SCCF) – a logging operation owned by the Town of Sechelt. The area is surveyed for clearcut logging, and could be destroyed in a matter of months. There’s been no public process to gain social license on this block. What do you want your Sunshine Coast to look like, forest remnants fragmented by clearcuts and tree farms, or sizable areas of intact forest ecosystems? This natural forest features old growth Douglas-fi r, wildlife trees, ideal growing conditions for Chanterelles, Pines, and Turkey-tails. If you enjoy foraging for mushrooms to add fl avor to a meal, this forest ranks as one of the best picking sites. You’ll be shown a pioneer trail leading to alders V-cut to obtain chips for salmon preparation. This forest is also home to Roosevelt Elk – a majestic animal that was exterminated at the turn of the century by settlers. At this time, Ministry of Forests and SCCF are willfully blind when it comes to protecting its winter sheltering habitat of mature and older forests. We hope that will change soon. See you this Sunday for a walk-about in this exceptional forest, so close to home. ‘The Chanterelle Forest’ lies within the traditional territory of the shishalh Nation. If you can’t make it out, but are concerned, please email the Forest District Manager, requesting that he defer Blk EW28 until Elk habitat mapping is completed across its range. His address is: derek.lefl er@gov.bc.ca ELPHINSTONE LOGGING FOCUS When: Sunday, November 12th @ 1PM Meet: Sunshine Coast Regional District (SCRD) parking lot at the north end of Field Rd, Sechelt The Chanterelle Forest is the westerly boundary of an expanded Mt. Elphinstone Prov. Park – support by SCRD OCP Bylaw 641.